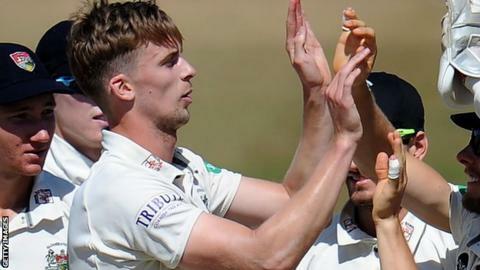 Fast bowler Craig Miles has agreed a move to Warwickshire from Gloucestershire from next season. The 24-year-old will join the Bears on a three-year contract having made his Gloucestershire debut at 16. "I'm absolutely delighted to be joining up with the squad," Miles said. "I'm aware of the talent and ambition and can't wait to get started." Miles will follow current team-mate Liam Norwell to Edgbaston, who also finalised a move last month. "Just two weeks ago, Craig showed what an exciting prospect he is by taking 5-69 against us at Edgbaston," Warwickshire sport director Ashley Giles said. "He has the opportunity to go far in the game if he continues his development and makes major contributions for Warwickshire and Birmingham Bears."